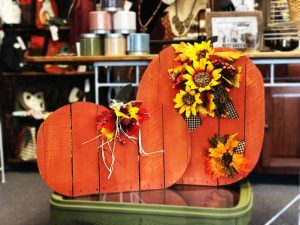 Pumpkins are perfect for fall decorating and these locally made wood pallet pumpkins are the perfect addition for your home or outdoor entry décor. You’ll paint your pumpkin (choose from two available styles) in your choice of colors using Country Chic’s All-In-One chalk style paint and glazes during this two hour class and then embellish your project from a selection of raffia, ribbons and florals. The class is $39 (+tax) and includes all supplies for one pumpkin, instructional materials, a 10% coupon off Country Chic products good on class day, and refreshments.